Authored by vpilo on Jan 24 2019, 5:34 PM. Next time please upload images directly to Phabricator. Do you prefer a right click over a settings or 3-dot button? There's already very little space - I personally think it would become cluttered. An alternative might be a link when the connection is clicked (and gets expanded). Or a button that appears next to the connect/disconnect button only on hover, but I don't know if this is an UI that could cater to other kinds of flows, like touch. I think a context menu is fine here, since it's not replacing anything else. We can examine the non-right-click presentation later. It might be nice to have a Configure button/icon show up on hover just like the disconnect one does. That's what Kirigami lists do. I'm not convinced this is needed at all. How often do you need to modify a connection? I also don't think many people would discover this feature, because many of them also didn't discover context menu in KCM. 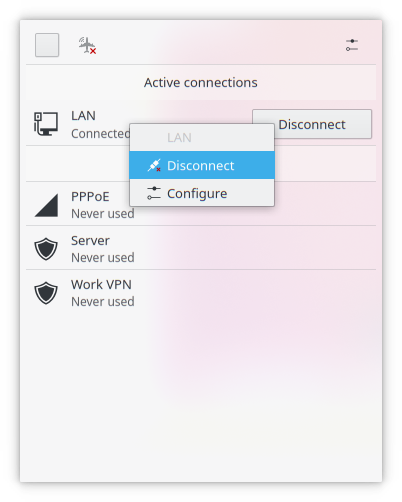 Now when you want to configure a connection, you go to the settings button in the top right corner and you can easily configure a connection. With your change you need one click with the right mouse button and additional click on the configure button. It's true that in the KCM it might be harder to find connection you want to edit, on the other hand there is a search bar. I'm not convinced this is needed at all. How often do you need to modify a connection? Often enough that it annoys me that I have to open the connection editor first and then search the connection *again* in the list of connections. +1 for the change. I would prefer PlasmaComponent.Menu here which is a "proper" popping up menu rather than an inline item like QQC2 unfortunately always does. I don't think this header is needed, we hardly do that elsewhere. I guess you can just use the stateChangeButton text? Okay, I will not be against it since it basically doesn't change anything, just adds additional functionality. Does it work for you on wayland? When the menu opens, it opens in the left top corner of the applet and cannot be closed unless you select any option, but that's probably wayland + qt fault or perhaps it will change when using PlasmaComponents.Menu instead. Does it work for you on wayland? vpilo marked 4 inline comments as done. Works for me with PlasmaComponents.Menu. I didn't want to interfere with other buttons/mouse actions/gestures. I tested without this and it looks like there's no issue. I took it out. I thought it made it easier when the wifi list changes to recognize if you clicked on the right item. Should I still take it away? Jokes aside, it can be pretty useful to give arguments to KCModules. Looks good to me, I woud personally keep the header in the popup menu, at least I know I clicked on correct connection. I can no longer right click the details entries (e.g. IP address) to copy them to clipboard, the menu is blocked by this new menu. Perhaps the menu should only be on the text sections of the list item rather than span the entire delgate including details and plotter. I tried. Somehow, even if I should be able to, I can't access the font property. The applet fails to load. Looks like I can't, none of the items in the object tree seem to support that property, and it's not in the Qt dox? It's only in a few kirigami items. Can you be more specific? Are you suggesting I use another type of Menu? Darn, can't help then. Maybe @mart can?